Here we go, guys. 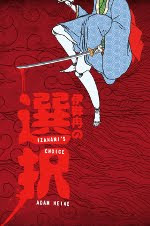 Izanami's Choice has a release date! It will be available for purchase on September 1st, 2016. And now for answers to some common questions. Q: Why am I only finding out about this now?! Clearly you haven't subscribed to my awesome newsletter. If you had, you'd have known this over a week ago AND gotten an exclusive excerpt from the novella AND gotten the free short story that everyone gets on subscribing. But don't worry -- that won't be the last exclusive my subscribers get. Obviously, the only reason you aren't already signed up is because you didn't know about it, so you can remedy that by subscribing to the newsletter right now. 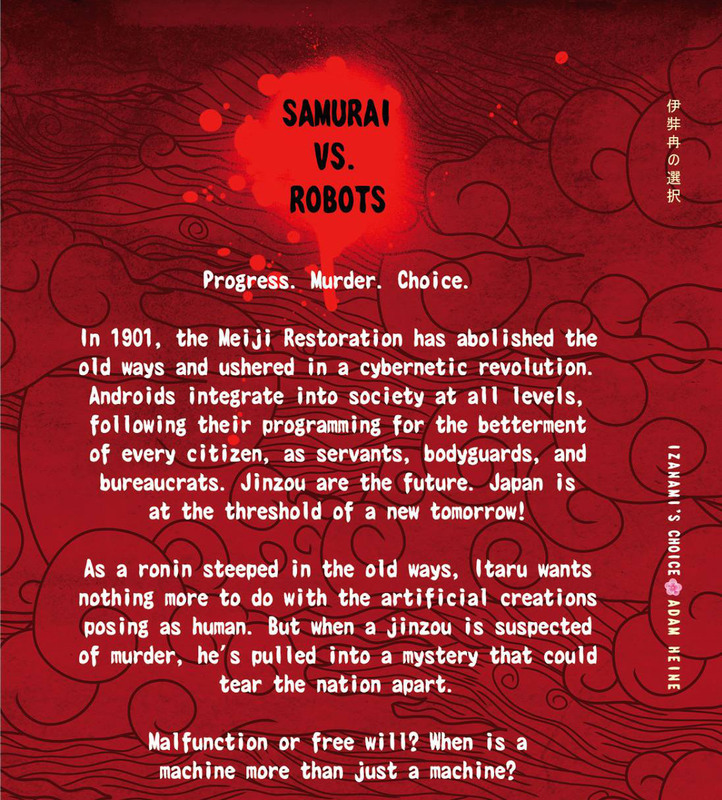 Q: I want samurai sci-fi today! 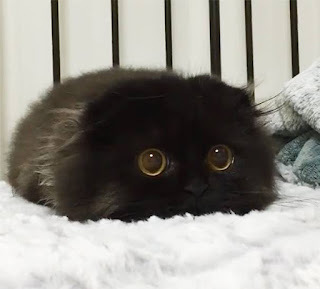 Why so long? The anguished howls of the deprived fuel machines buried deep beneath their offices, which in turn get them 20% off their electricity bills. An old woman told them September 1st would be the first time in 500 years that the moon would be in conjunction with both Mars and with Voyager 1. They believed her. September is my birth month and they wanted an excuse gift in case they forgot to get me a real one. Q: I want to interview you and/or review your book for my followers/blog readers before it comes out. Awesome! I would love to talk to you about that. Q: But I don't want my paperback from Amazon. Great! You can get the paperback directly from the publisher if you want. Q: Why paperback so expensive, man? Yeah, so, here's how part of publishing works. There's the Big Guys -- the publishing houses like Penguin and Random and Penguin Random -- that do these enormous print runs and ship them to all the bookstores in the world. They can do this because printing thousands of books is way cheaper than printing a few, and because they know they'll sell thousands of books (or close enough) so why the heck not print that many? Everybody else -- small presses, indie authors, and even Amazon -- has no guarantee of how many will sell and can't afford to print thousands of books only to be stuck with them later. So everybody else has to print paper books on demand which, as you might imagine, is more expensive. But at least that way they don't get stuck with lots of books and debt. 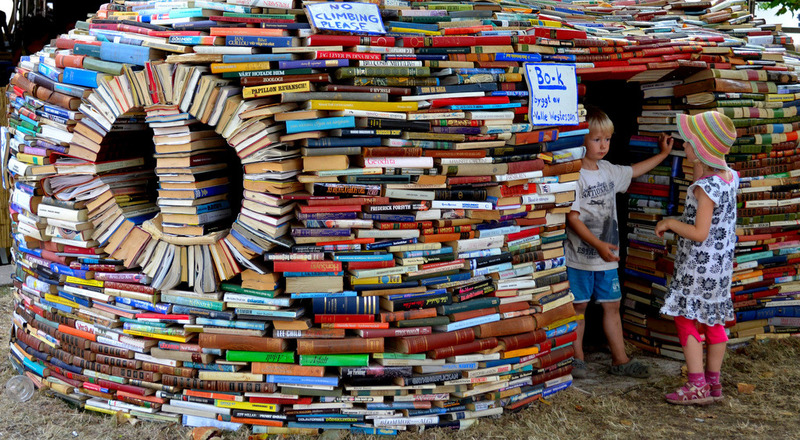 Because as cool as it is to make a hobbit-hole of books, it's cheaper (and more structurally sound) to not be stuck with them and to build your hobbit-hole out of dirt and bricks like a regular person. Q: I have a question that you neither answered nor anticipated. To the comments, good madam or sir! If you follow me on social media, you may have seen this, but it's important that it's here. So behold! 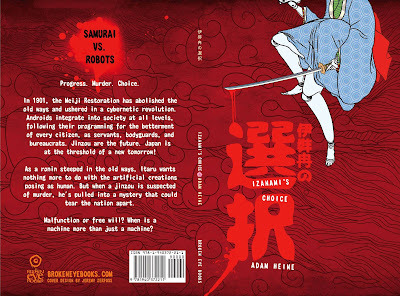 The cover for my upcoming samurai sci-fi novella IZANAMI'S CHOICE! CLICK TO EMBIGGEN! 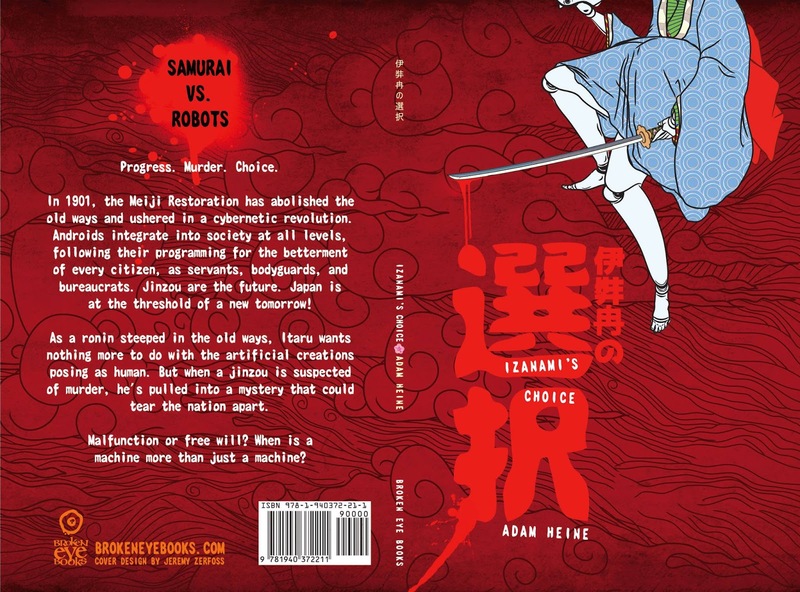 I love what they've done here -- the droid legs, the sword, the bloody kanji characters, the part where my name's on the cover. It's all just great. I don't have a date for release yet, but I'll let you know when I do. It should be soon. If you want to make sure you don't miss it, sign up for my newsletter here. I haven't actually sent out a newsletter (because I promised only useful information), but as soon as there's a date or a pre-order link or something, you'll get it there. There may also be another pretty picture I get to show you later. We'll see! 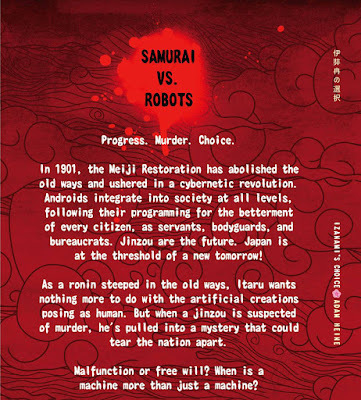 In 1901, the Meiji Restoration has abolished the old ways and ushered in a cybernetic revolution. Androids integrate into society at all levels, following their programming for the betterment of every citizen, as servants, bodyguards, and bureaucrats. Jinzou are the future. Japan is at the threshold of a new tomorrow! 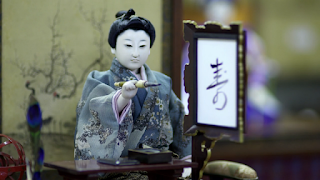 As a ronin steeped in the old ways, Itaru wants nothing more to do with the artificial creations posing as human. 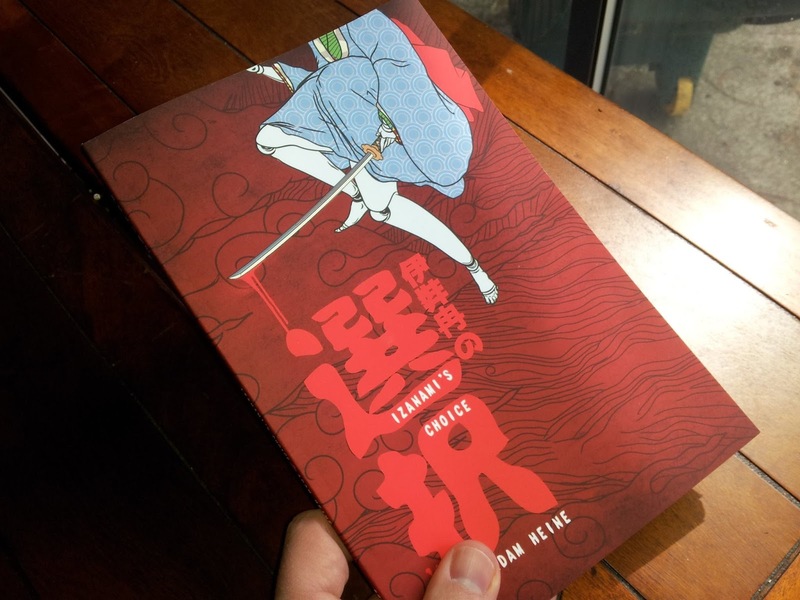 But when a jinzou is suspected of murder, he's pulled into a mystery that could tear the nation apart. Malfunction or free will? When is a machine more than just a machine?